Hidden amongst the big blockbusters this summer are a few indie gems. 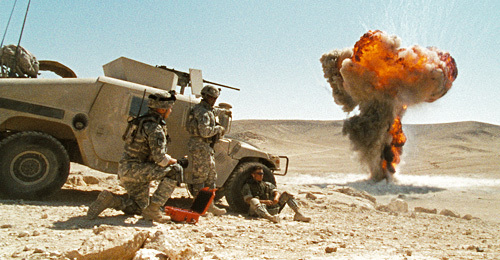 One of them is The Hurt Locker, a fantastic look at the life of bomb techs in Iraq. Don't worry, this isn't another "Iraq war movie" with a political message, it's a great action movie that just happens to be set in Iraq. It's directed by Kathryn Bigelow, of Point Break and K-19: The Widowmaker previously, and is written by Mark Boal, a journalist who took his own experiences in Iraq and wrote them into the script. A month ago I talked with both Kathryn and Mark and it was one of the most fascinating and revealing interviews I've done. Read on! If you haven't seen the trailer for The Hurt Locker yet, then before continuing, make sure you watch it. There are no spoilers in this interview, but we cover topics regarding shooting in Jordan and the realism of the movie as well as approaching the story and how it was written. I really had a good time talking with Mark and Kathryn, as they both had some interesting things to say. And I really can't suggest enough that everyone make sure they try and catch The Hurt Locker in theaters this summer - it is a must see. The first question I need to ask is where the idea for this originally came from, or how this project came about in its inception? Kathryn Bigelow: Well, I'll turn that question over to Mark, since he is the -- he's responsible for the genesis of it. Mark Boal: Well, pretty much there's not too much to tell. I was an embedded reporter in Iraq and I came back from having spent some time with the bomb squad and watching them disarm bombs in the heat of combat. And I knew Kathryn Bigelow from before that experience. Anyway, I told her about it, and she said, "Hey, that's a movie." Or, "That might be a movie." And I said, "Really?" And she encouraged me to work on a script, and then we developed a script together that was a fictionalization of what I had seen over there, but still pretty authentic as to what soldiers go through. And that was the beginning of it all. So as everyone has been saying, this isn't a war movie. Or it's not trying to be sold as a war movie. And obviously in watching it, it's set during the Iraq war, but you don't necessarily feel the political aspect of it. So I'm wondering, was your goal just simply to tell a good story around a good movie? Or were there any other reasons for wanting to tell this story besides that it sounded, as you said, like a good movie? Mark: I'm curious what you think about that, since what you think is really more important than what we think. Well, I mean, it sounds like -- I made the comparison when I got out of it, to Black Hawk Down. And I think that's not negative by any means, because I love Black Hawk Down. Kathryn: Oh I do, too! And the funny thing is, when I think back to Black Hawk Down I don't think about its political implications, I don't think about, anything it's trying to achieve besides being a great film cinematically. And I think that's what The Hurt Locker does. It's just in this situation, in this time frame where politics are so important, and where so many wars movies have tried and failed, this, I hope, is going to stand out in comparison to anything else. Mark: Let me interrupt you for a second, now that I understand where you're coming from, if I could. Mark: Just on background, if I can just-- my two cents about what you're talking about is that there hasn't actually been a movie like Black Hawk Down, which I would term a combat movie or a war movie. If you go into a video store, it's under the war movie aisle. The movies that have come out about Iraq have been dramas, domestic home-front dramas. So to me, that's why I think that's a catalyst for them, you're kind of talking apples and oranges. I mean, regardless of what one might think of Stop Loss, for example, as a movie, it's a different kind of movie from Hurt Locker altogether. You know what I mean? You can't compare Black Hawk Down to On Golden Pond either. One's a relationship drama; the other's a war movie. So anyway, to us this was really a combat movie, and yeah, we wanted to make a story that worked on its own terms that was thematically interesting. And you know, there's that whole thing about how there's no politics in the trenches. And I think that was important for us in terms of making it tense and exciting and not have a bunch of guys giving speeches. This may be a little bit hard-hitting, but I'm curious why this ended up being an independent production. To be honest, I hadn't heard of it until the Toronto Film Festival last year where it premiered. And it sort of came out nowhere. And you look at most of the big combat films of past, and they're studio productions. But this is something that you guys, I'm guessing, independently financed. Was there a reason for that? Mark: Yeah, but the time you're talking about when you say "the past," I mean studios were very different in 1986 and 1976 and when Apocalypse Now was made and there was no independent cinema, really. So to make the kind of movie we wanted to make, that's the direction we had to go. Kathryn: Yeah, to make it without any creative interference, and it enabled me to have final cut. And so it's a real filmmaker driven piece. And that, gratefully, because of strong underlying material, and an inherently dramatic situation-- in other words profiling men who have arguably the most dangerous job in the world, it also has the capacity to be very raw, immediate and highly accessible. So I don't know, our interest was to, I suppose, protect the creative process. That's admirable, of course, in this day and age where we hear so much about the studios clamping down and editing and making changes that aren't necessary. I think a lot of the indies I've seen come out of festivals have been fantastic for that reason. Kathryn: Fantastic for that reason! I totally agree with you. Can you speak a bit about the shooting process and the realistic aspect? I heard during the Q&A that you had shot in Jordan, correct? Kathryn: Yes. We shot in and around the city of Amman, Jordan. And a couple of our locations were about five kilometers from the Iraqi border. And actually just a slight short digression, Barry Ackroyd, our cinematographer, a great, great cinematographer in my opinion, wanted to shoot in Iraq, since we were so close to the border, but our security couldn't guarantee our safety because of snipers. Anyway, we were close, but we were fine in Jordan, obviously. And our extras, and our bit players, were actual Iraqis who were refugees who are now living in Jordan -- refugees from the war, from Baghdad, and so I suppose our feeling was if you're shooting a movie about that particular conflict, you want to get as close to the conflict as you can. Mark: Well, we wanted to make -- just to build on that, we wanted to make the most realistically intense thing you could. So that's why -- if you look in the production notes, you'll see there's pages and pages of all the different things we did to accomplish that, and to me, it's a high compliment if someone says, "Hey, that seemed really realistic." That's kind of what we were going for. And that's a little bit different than maybe the goal of something like Transformers. Mark: You know, they're not really going for realism there. They're just going for spectacle. So I don't know. I kind of digressed there. Well, the reason I bring up the question is there was never a moment that I felt that this wasn't a literal documentary of what was happening to this crew. And I loved being able to get into that. In thinking back to it, the filmmaking and what you achieved, Kathryn, was just impressive in terms of making it feel so real, and making it not feel not even like a film. Like Transformers, yeah, it looks great and it's polished, but I never felt like there were even any CGI moments. There's nothing. It was just like this is literally happening, these are real bombs about to blow up in this guy's face. Kathryn: Thank you very, very much. I mean, that was clearly my intention as a filmmaker -- to parachute the audience into the day in the life of a bomb tech in Baghdad circa 2004. Can you speak about casting with Jeremy Renner and how you pulled these guys together? They must have spent a lot of time out there, too, shooting? Just sort of getting used to it? Kathryn: Well, Jeremy spent time with an EOD, Explosive Ordinance Disposal team, at Fort Irwin in California before he left for the Middle East. And I think that was incredibly informative for him. And so the thing when you're there, again, it's a complete immersion. You're kind of, in a way, in character, in situ, in context, 24/7. So it was a great opportunity to work on the performance. Was there a lot of -- I hate to use this word, because it's more often for comedies -- but was there a lot of improv? You probably had a good script to start with, but how much actually happened while you were shooting in terms of letting them just progress with their characters? Kathryn: My feeling is that we really kept very close to the script, and if there were changes, Mark, who was on set the whole time, if there were changes, he was privy to it, and/or responsible for it. If we made changes, it really had to do with the logistics of a location that we didn't anticipate. But might have actually been more interesting, more complicated, more surprising than we anticipated. And then he folded those logistics into the script. So that way we were shooting from a script that reflected the exact location of where we were. So we kept constantly polishing, polishing as we were shooting, up to camera. Which is a real luxury, I might add. This is not something that happens readily, unfortunately, I think the film is really enhanced as a result. Yeah, I think it even speaks to the authenticity and to his involvement at that level. You can just turn to him at any point and say, "Is this how they do it?" Kathryn: Exactly, and which I did, constantly! You know, "How did they do this?" Because we developed it -- I did the development with him, and so I was able to ask some of those questions during that process, about some of the protocol and understanding it. And then I've spent some time with him, with EOD techs, to do my research, my "embed," so to speak. But really having him there on-set and able to be this tremendous resource was just magic. How has the reception been as its progressed from Toronto onwards? Is this what you expected for it? Kathryn: I think we were just working too hard to even anticipate anything. Anything beyond the call sheet of that particular day. Speaking of how much work you did, how much of it was done practically? Is there any CGI work? Is there anything that was added after shooting? Kathryn: None to speak of. Maybe a crew reflected in a visor was about it. Kathryn: But it's very -- it was all in-camera, and I had a phenomenal camera crew, as I mentioned Barry Ackroyd, and then four other camera units as well. Not just cameras, but entire units that were shooting simultaneously. So we came back with a lot of footage. Mark: It's like that old Ivory soap commercial, 99.44 percent pure soap. Kathryn, you brought up -- I just wanted to elaborate on this further -- your shooting style and using so many cameras. This goes back to what I was asking about earlier about letting their characters go. Do you set up the scene and just let it play? Was that what your idea was for using so many cameras? Kathryn: No, I mean, I actually [story] board -- and as Mark would be writing the sequences, I would be boarding them. And even though at that point, we hadn't decided on Jordan, we were still scouting Morocco, and debating between the two countries, until we settled on Jordan. But nonetheless wanting the process of bomb disarmament, which I find very geography-centric. In other words, you really need to understand up-range, down-range, and kind of a 300-meter containment, and the bomb tech walks down on the bomb, that sense of 100 meters, 50 meters, 25 meters, and, kind of, life as we know it dissolving into that point of no return where there is no turning back. Wanting the audience to really understand that. Because when Mark came back and he talked about this process, and then of course, as I began to immerse myself, he was already -- he came pre-immersed. It became very important that I had to stage it a certain way to make that process apparatus very clear to an audience. And I think the clearer it is, the more tense, the more suspenseful and more exciting it is, because you're really witnessing what these incredibly unsung heroes do. Thank you to both Kathryn Bigelow and Mark Boal for taking their time to talk with me! 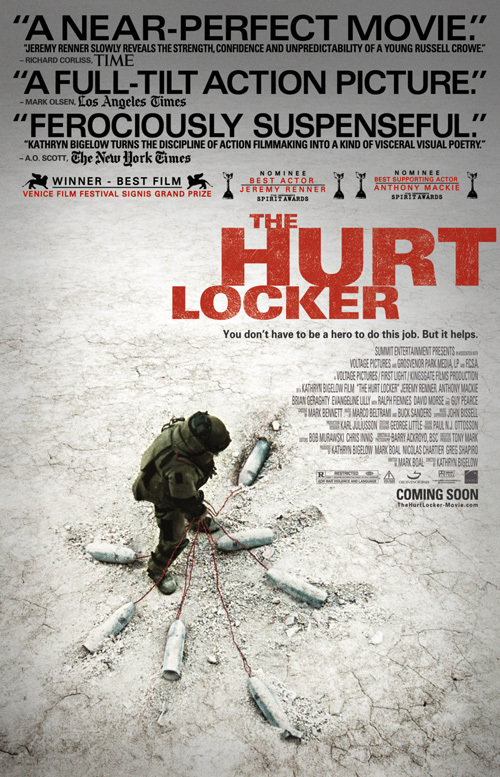 The Hurt Locker arrives in theaters starting on June 26th this summer - please go see it! Looking forward to this one. Can we get a moratorium on this "indie gem" phrase? Looking forward to the third film in her BOMB series, WEIGHT OF WATER, K-19 and now this one. The first two were box office bombs. The third about avoiding bombs! Good decision! Can't wait!!! i've seen this, and its very good. more suspense than action movie, i'd say. not political at all, like the other crappy iraq war dramas, as mentioned in the interview. evryone should check it out. Glad you mentioned Point Break. It's still one of my all time favorites. dude, the movie was nice. I like it. Basically, this movie is about a guy who loves his dangerous job. He's like an Alaskan crab fisherman, but he fishes for bombs! Incredible movie, and I loved the ending. It really hit home. cant wait to watch this one !! I really like Kathryn Bigelow's work (except K-19, which was boring). Point Break is awesome. # 1 it really isn't a political film, I saw it expecting the same thing and it really didn't form a opinion, really pro and anti themes didn't seem that evident. This movie has had great reviews. Looking forward to seeing this. Like Xerxex I came away from the film with the same opinion because it tends to balance both side of the argument be it political or not, if anything the film does a fantastic job of showing how life really does hang in the balance out there and it does it with some powerful and thought provoking scenes. This is a different pace to Bigelows Point Break ( it is after all about the delicate job of Bomb disposal) but it has some great characters and worth seeing. Yeah! Indeed that is a splendid movie. Good work from the technical team as well as the director.I bet that at last you will be carried away by this film. So, for action Lovers here this one is for you. Enjoy!!!!!!!!! It was a very interesting interview but the movie itself should be a good one.